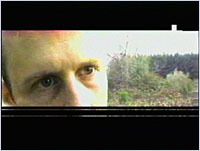 A 'piece of Shawn's brain smeared onto videotape', this movie was one of the first movies produced by Junk Productions. A story of Shawn's about meeting friend Sophia, it includes shots of Shawn in a graveyard, and standing in front of a brick wall while film of Sophia is projected onto him. No, Sophia isn't really dead. Anyway, a very well-edited and interesting piece, this one was only seen at the 2000 DaVinci Days festival until it was finally included in American Peephole in 2002. This one is defiantly a collage; don't think I could count the number of layers, or the mediums used. I shot S.O.F. by myself without benefit of a cameraman or a monitor. A good deal of the strangeness comes from having to fit myself into a shot I didn't know the exact frame of. I recorded the footage over a period of about six months, and did not complete the editing or record the "kitchen" music until a few months after that. Jenn and I made the music in her kitchen with utensils like cheese graters, forks and metal bowls. All & all, this was the work of time, caffeine and erosion.